Bundesliga | Atletico Madrid 2-0 Borussia Dortmund: As it happened! Atletico Madrid 2-0 Borussia Dortmund: As it happened! Paco Alcacer, Jadon Sancho & Co. will look to fire free-scoring Borussia Dortmund into the UEFA Champions League round of 16 when they meet La Liga outfit Atletico Madrid on Tuesday (kick-off: 9pm CET/8pm GMT/3pm ET). Dortmund head to the Wanda Metropolitano in the Spanish capital for the first time with a spring in their step following three consecutive wins in Europe that sees Lucian Favre’s men sitting pretty at the top of Group A at its halfway stage. A point will be enough for Dortmund to seal safe passage to the next round, and the side will be buoyed by their 4-0 demolition of Atletico at Signal Iduna Park on Matchday 3, as well as a run of form that has seen them make a 15-game unbeaten start to the season in all competitions. Alcacer has wasted no time in settling into life in Black and Yellow, scoring eight times in all competitions as Dortmund have brushed aside most opponents so far this campaign. Add to that Marco Reus’ seven strikes and the combined total of 12 goals and assists from Sancho, and Dortmund’s potency in front of goal will worry an already wounded home side. The defeat in Dortmund a fortnight ago was the heaviest of the Diego Simeone era, but the Madrid side had bounced back with wins over Real Sociedad and Saint Andreu, before drawing with Leganes at the weekend. Los Rojiblancos are four points behind La Liga leaders Barcelona after 11 matches, but may need to win their remaining four games in Champions League Group A if they’re to overhaul leaders Dortmund. Monaco and Club Brugge are third and fourth respectively, with a point apiece. French World Cup winner Antoine Griezmann is Atletico’s top scorer in all competitions this term with five goals. Fellow forward Diego Costa has missed the club’s last two games with injury, while captain Diego Godin and midfielder Koke also missed that draw with Leganes. Watch: The new-look Borussia Dortmund! Sancho scored his first Champions League goal in the 4-0 win over Atletico last time out.Dortmund’s Matchday 3 victory was the first time Atletico have conceded four goals in a game under Simeone. 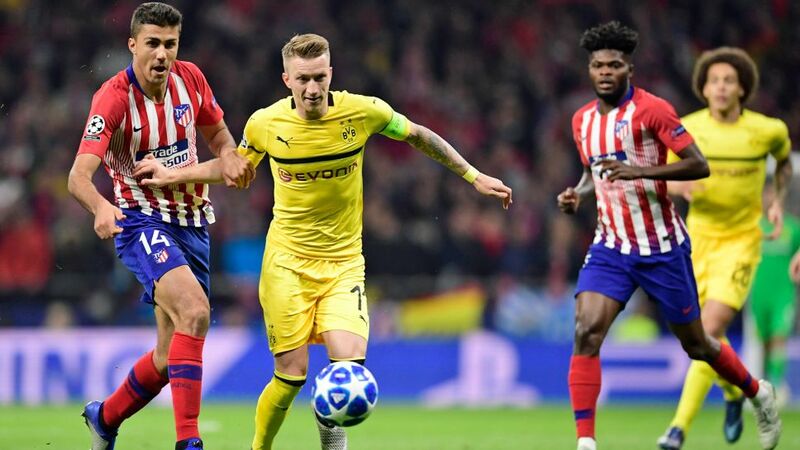 The two previous seasons that Dortmund and Atletico have met in European competition both ended in Dortmund claiming continental glory (1996/97 Champions League, 1965/66 European Cup Winners’ Cup). No player has scored more than Alcacer in the Bundesliga this season, with the Spaniard netting seven goals in five appearances. Meanwhile, Sancho tops the domestic assists charts with six, adding to his four league goals.Not only are Dortmund the Bundesliga’s top scorers this season (30) but only RB Leipzig (9) have conceded fewer than the 10 goals BVB have shipped, and they are yet to concede in Group A.